According to Harvard Business Review, customers who have developed an emotional bond with a brand are described as ‘fully connected customers’ and are over 50% more valuable, on average, than even a highly satisfied customer. These fully connected customers purchase more and are less likely to be price-sensitive. Forging positive emotional connections paves the way to brand loyalty and life-long customers, thus an organic growth strategy for your business. More than 65 percent of those surveyed in Harvard Business Review shared that being emotionally connected to a brand made them feel like the company or business cared about people like them. How do you get people to feel like that about YOUR organization? Part of your customer’s experience is their interaction and connection with your organization. What are you doing to strengthen your customer’s perception and experience of your brand? Consider, when you are sharing a post on social media or writing a newsletter piece: what feelings might this spark? Do you convey that you care about the person engaging with your content? Do you convey that you are making a difference in the world and that you care about the same or similar things that they do? Michigan Radio Sponsorship is an excellent way to forge an emotional connection with the audience you are trying to reach. 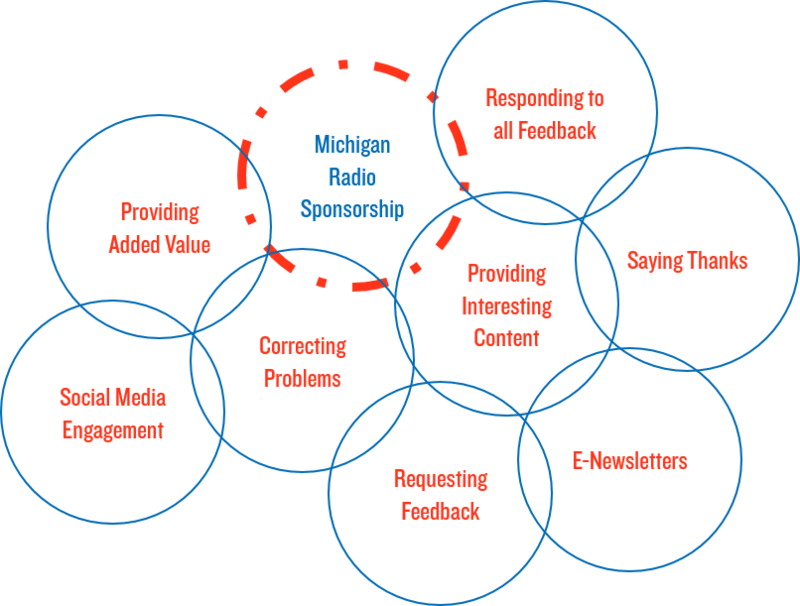 Your sponsorship message on Michigan Radio offers the listener an opportunity to positively perceive and experience your brand. Your message allows the listener to know that you share similar concerns. In addition, your brand will be connected to our well-established and trusted brand, giving you access to the coveted public media Halo Effect. The Michigan Radio audience is made up of ‘fully-connected customers’ – our members financially support the station and are 74% more likely to do business with an organization that also supports us! A fully-engaged, emotionally connected audience across Michigan is ready to hear your message – what are you waiting for? Contact us to get started! Posted in Branding with Michigan Radio.